Heat oil in a medium sized saucepan on medium heat. You’ll know when the oil is hot enough when you place a single kernel in the pan and it whizzes around and bubbles slightly at its edges. Now pour all popcorn kernels into saucepan. Cover and shake occasionally until all kernels have popped. Pour popped corn into a large mixing or salad bowl. Add cinnamon and salt. Toss well and serve. Please note: If your dietitian or diabetes educator has advised you eat a snack worth 15 grams of total carbs between main meals, only serve yourself 1/3 of the popped corn to stay within this limit. The total amount of popped corn in this recipe is equal to approximately 3 of those snack servings. 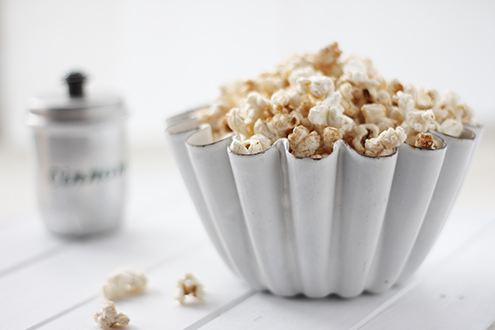 Popcorn will stay fresh in an airtight container for several days if you want to prepare in advance.